Every generator needs a way to distribute the power that’s generated. Home Power Systems offers the following Generac transfer switches that offer time proven longevity. These switches can be installed indoors or out. Call us for the switch that meets your solution. 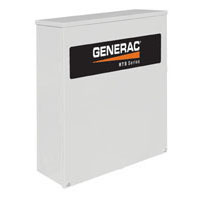 The Generac 100amp model transfer switch offers automatic standby operation for the installation of Emergency Distribution Panels (EDP’s). This switch cannot be used as a service entrance switch. Consult with Home Power Systems before ordering to make sure your solution is correct.